I've done very little in the last twenty four hours besides watch Season 2 of Californication. The show is amazing on many levels - of which I feel unable to write about as I am saving my writing mojo for elsewhere right now (a screenplay) -- but here is a scene that is absolutely hilarious. Hank Moody (David Duchovny), much to the dismay of his on/off girlfriend and soulmate Karen, has impregnated another woman. When it finally comes to her giving birth, Moody and Karen are there when this hilarious moment happened. Great TV! 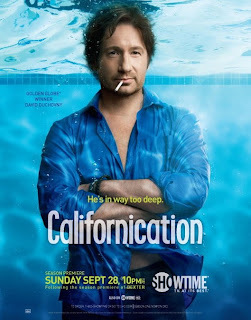 If you haven't already seen Californication, I definitely recommend it. It blends profanity and controversy with tenderness and emotion; it's pretty magic. This series is on my netflix queue. I'm really looking forward to seeing it! wow, sounds like a great movie. thanks for the recommendation! I will definitely watch this too. just watched all three seasons last week. freaking hilarious!